Surveys show that one of the most pressing regrets of brides about their marriage was not hiring a Wedding Planner Samples. The wedding day is undoubtedly among the most critical of events in the life of a person, and it is understandable why everything needs to go as per your plans. Surprises can always take the form of late deliveries, power outages without backups, canceled car rentals and other such things. Having a wedding planner helps as you don’t just have the option to shift your responsibilities but also have a guarantee that everything would be taken care of as expected. Wedding Planning is more complicated that you ever thought it would be. Especially With an Indian wedding, the checklist just keeps on increasing. Well, here’s a wedding planner that should help you put down everything into hard paper and follow a course of planning. 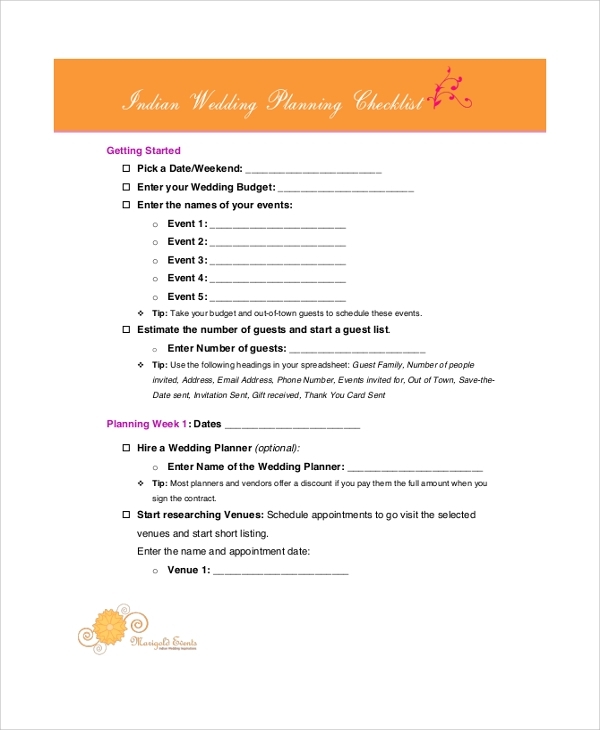 From setting a Wedding Budget Calculator to planning the various events, this wedding planner should take care of everything. Just make sure, you put everything down in it. The budget is always the primary concern when you are hosting/planning something as big as a wedding. It’s not just about the amount you should spend but all the different things (heads) that need to be taken care of. This wedding budget planner will help you in setting up an expenditure limit and plan everything accordingly. With an Indian wedding, ceremonies and events form a part of the wedding ritual and begin several days before the actual wedding. There are several important ceremonies to take care of even after a wedding is completed. With so many events to track and organize, sticking to a precise timing can get difficult. 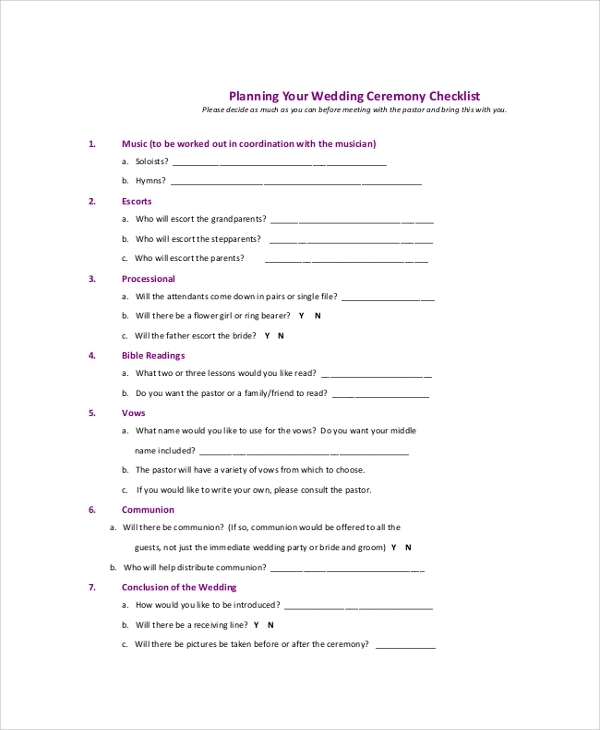 Well, this ceremony checklist planner should help you out. Apart from the timing, the checklist will also take care of budgets, items and other things important to an event. 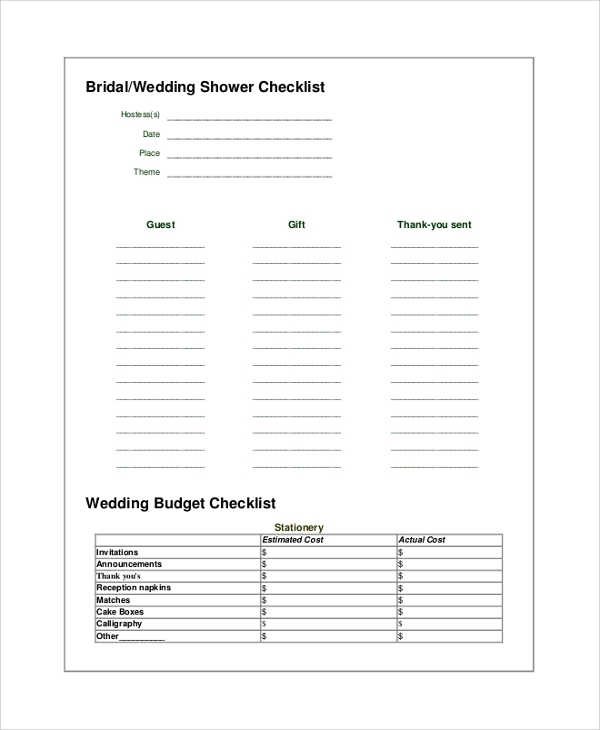 You may also see the Wedding Checklist Samples. 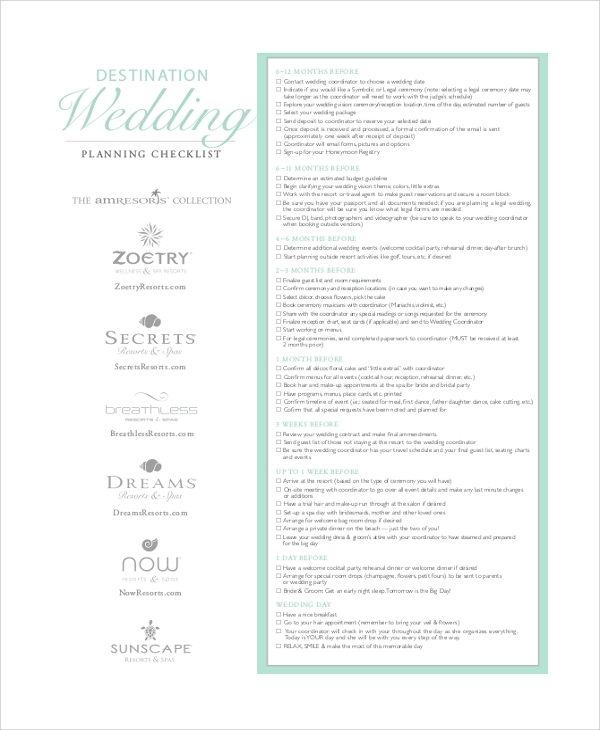 Who Needs a Wedding Planner Checklist? A wedding planner is necessary for anyone in charge of the wedding. In most of the cases, it will be the joint effort of the to-be bride and the groom. However, there can also be an active involvement of close family members and friends too. Preparing for an approaching wedding date can be a stressing and tiresome job. Even thinking about it can eat up your whole day. It is always good to have a planner handy. 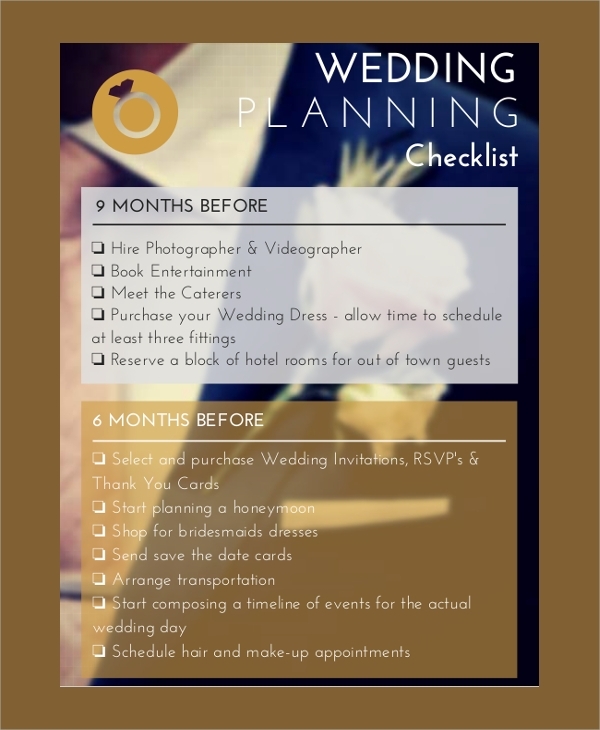 This particular checklist allows you to take care of the events and your personal form right before 6-12 months of the exact wedding date. When approaching a wedding date, it is always helpful to have a timeline checklist defined and handy. As you keep on taking care of things like working out a budget, researching florists/photographers, choosing songs, ordering the cake, preparing the guest list, ticking them off on a checklist feels good too. You may also se the Wedding Guest List Samples. 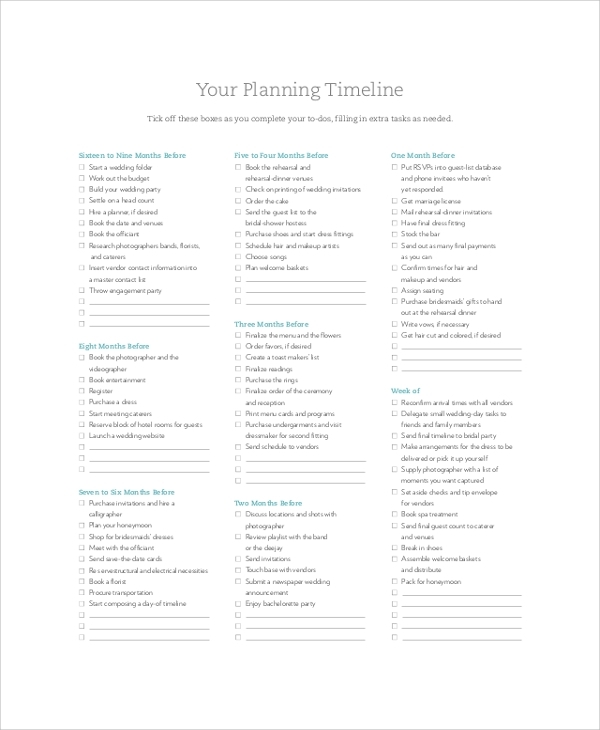 Why Do you Need A Wedding Planner Checklist? 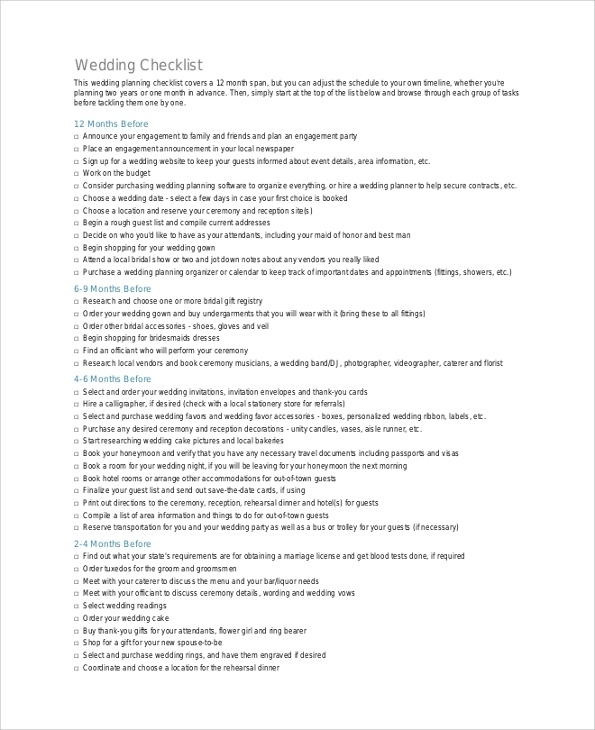 Wedding Planning Checklists always makes your wedding planning easier and helps ‘not forgetting’ events, appointments, and deadlines. It’s a timeline for the most important event of your life. 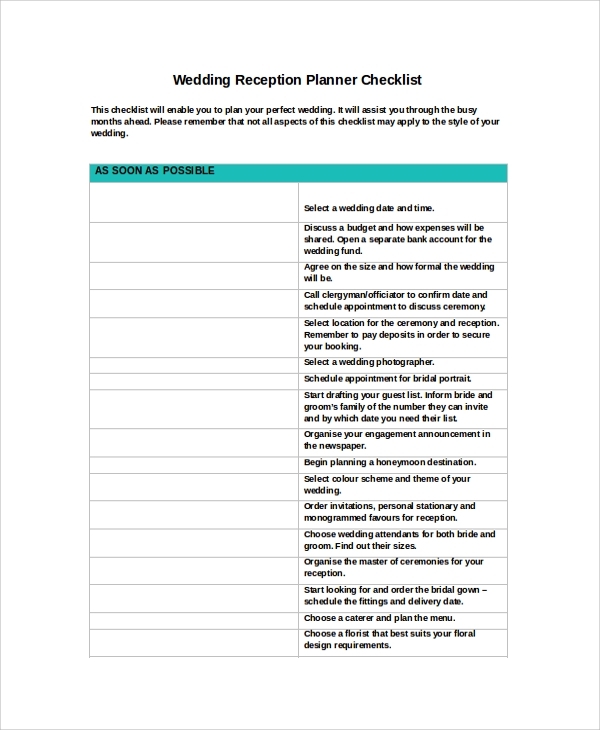 All these wedding planner checklists are available as Sample Checklist templates and can be downloaded as PDF files. We wish you all the very best for the wedding ahead.